But he also wrote the Christmas carol, I Heard the Bells on Christmas Day. I came across the story behind this carol a few years ago. I don’t remember the source, but this link recounts it. Henry Longfellow was acquainted with sorrow. His wife had died tragically in a fire, and then his son was badly wounded in the American civil war. For years he was unable to feel any joy at Christmas time, and it was during one of these Christmases during the war that he penned a poem entitled Christmas Bells, which was later put to tune and renamed I Heard the Bells on Christmas Day. The verses that remind us of the civil war are removed from our carol today, but for me they give greater meaning to the poem. How often do our own tragedies “drown the sounds” of peace in our lives? At times we all have our personal earthquakes that “rend” our lives and make us feel “forlorn”. But whether it be war, or personal tragedy, or anything else that gives us sorrow or withdraws peace from our lives, Christmas reminds us that the baby whose birth we celebrate at this time of year was the Prince of Peace. And because of Him, we all will one day have peace. 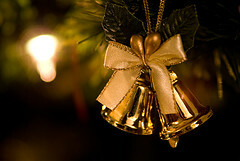 This the meaning behind the bells we hear at Christmas time. Categories: Poems | Tags: Christian, Christmas, Faith, Henry Wadsworth Longfellow, I Heard the Bells on Christmas Day | Permalink.